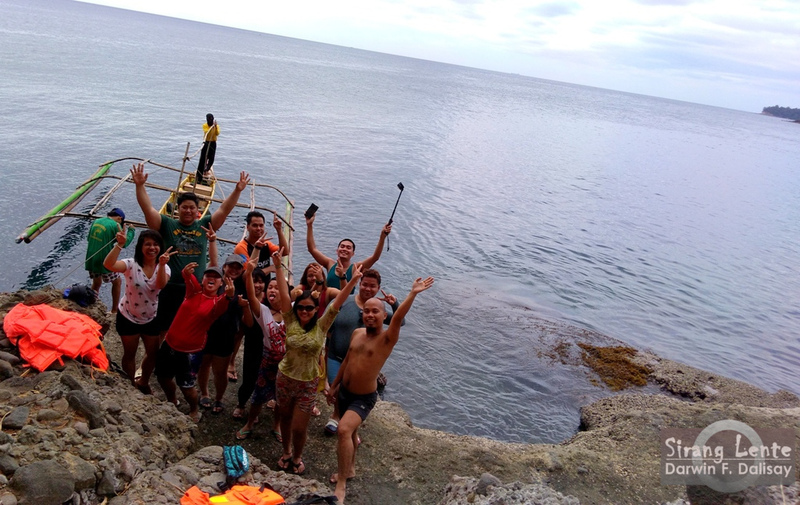 Breathtaking photos of Laki beach and Five Fingers in Bataan spread online; those were the reasons why we decided to celebrate JP's birthday at this paradise. When we were searching for an itinerary online, we're kept on getting stories about Attorney. Who is Attorney?? Until now, already witnessed the beauty but the question remains unanswered. What we remember are the gift, the wealth, the magnificent, and the spectacular landscape of Laki Beach and the Five Fingers. Photos below will explain. Meet our punong abala, she's Tin, not nine, but Tin. Instead of commuting from Manila to Bataan, we chartered a van, of course with driver kasi masakit sumakay sa van ng walang driver, tama? And I met the group at Five Star terminal on EDSA Cubao. No formal introduction yet because it was passed 1AM, so the others were sleeping. Travel time from Manila to Mariveles, Bataan was less than 3 hours. Our first stop was at Mariveles Public Market in Brgy. San Carlos. When I opened the door, I easily felt the cold air blowing. The ambiance in the area is really cool and relaxing, even though it's a public market. We had "Goto espesyal" for our breakfast while waiting for the entire market stalls to open. At the market, we bought pretty much everything, such as food and supplies. We also met our contact/guide who guided us to Brgy. Balon - the jump off. Travel time from the public market to the jump off is 45 minutes to an hour. We borrowed cooler, and other cooking utensils from our contact and bought potable water at the water refilling station by the jump off. Sari-sari stores are also available. Next part was a boat ride from Balon Port to Laki Beach. Boat ride travel time is within 30 to 45 minutes. While on the boat, the Mariveles mountain range, gorgeous rock formations by the waters and the other spectacular views were just pleasant in the eyes but the strong waves added an exciting part. At last! A sun-drenched beach greeted us by its beauty. We stepped on the shore of Laki Beach at around 9AM. It was still early, so we had much time to explore what this beach can offer to tourists. Photos above are proof as to "why you should visit Laki Beach." The shoreline has a combination of fine white sand, colorful shells, and small living crustaceans, such as small crabs. The area has a calm weather and surrounded by coconuts, perfect for picnic and swimming. On the left side of the shore are rock formations, which added an amazing backdrop. Not only that, a group of sea urchin spread on this part, so beware. Honestly, it was a lazy day because of its beauty. We have no choice but to start preparing for our lunch. Headed by Tin, our chairwoman for food and supplies, we prepared everything. There were rice, adobo espeyal by Karen, and of course for our side dish nilarong talong sa kamay ni Jeff. Imagine, lunch preparation lasted for almost two hours, but our lunch lasted for less than 30 mins. After lunch - HAYAHAY mode and socials PART 1. Spagetti for merienda and socials again up until the sunset. While the sun was setting, had our lights turned on and started preparing for our dinner. Aside from socials, preparing for something to eat was also our bonding. We had rice, freshly grilled liempo in soy sauce and spices, and salted egg mixed with tomatoes for our dinner. After dinner, HAYAHAY mode again for few minutes and socials Part 2. LIGHTS OFF, can't remember the time. The next day, I woke up at 3:42 AM. Opened the tent's door and let the cold wind enter. There were stars shining brightly like diamonds in the skies. The other groups were still drinking and shouting without even thinking that there are other people in the area. Sa mga event organizers or group leader, common courtesy po sana next time na pupuntahan nyo. Walang masama sa kuwentuhan at tawanan, kasama yan sa socials, pero kung sigawan ay abay hindi na healthy yan. Next time, wag nyo nang ilagay sa labas yung pangalan ng group na nakasulat sa tarp, nakilala tuloy kayo ng karamihan. Pati sa may cliff diving area, kayo napag-usapan ng ibang group, at kilala kayo dahil sa tarp nyo. For our breakfast, prepared hot coffee and choco, kinilaw na talaba nung gabi - crispy talaba na nung umaga unting init lang kelangan, sobrang kanin sa gabi - fried rice na nung umaga, at manula-mulang hotdog in virgin coconut oil. BREAK CAMP. Left Laki Beach at 8:25 AM. Instead of having an island hopping with full pack, we proceeded to Brgy. Balon and left our full pack at the house of our guide. Then, proceeded to our next destination. One of the most prominent spots in Five Fingers is where tourist can do cliff diving. Jumping on a 20-30 feet cliff is a must tried, but not for me. This challenge is for people who has strong will and has a brave heart and soul. I am not afraid of jumping, what I am afraid of is baka hindi na ako lumutan sa tubig. Instead, I took photos of those people who jumped and the discovered the hidden treasure. The area is abundant with live crustaceans, the clear emerald waters serve as a sanctuary of different fishes, and is surrounded by cliff hanging and artistic rock formations. A hill of stones perched in the water. Here's my comfort zone, rock climbing. We visited other spots, like the cave by the water, and another cliff diving spot, this time it's only 6 feet, so I tried it with life vest. At 12 NN, we headed back to the jump off. TIDY UP. LUNCH. And headed back to Manila. All of us were tired because of that 4-hour island hopping, slept while on the road. To all the participants, Thank You so much! See you on the next voyage. Sana maglagay kayo ng peace keepers hindi lang taga singil ng entrance. Peace keepers na ang role ay talagang panatilihin ang katahimikan sa lugar. Sawayin ang mga grupong hindi marunong umintidi sa mga salitang "common courtesy." Kung kailangang busalan ang bungaga ng tatlong pirasong saging, gawin para manahimik. hahaha. saging talaga naisip ko. Syempre joke lang. Pero real talk, people are traveling to discover and search for peaceful places where they can relax. Secondly would be the boat schedules. Pag may contact/guide ba, kailangan parin bang pumila sa port? Dapat hindi na, kaya nga contact ee. Dahil medyo malinis ang tenga ko, naging minor issue namin yun. Actually hindi alam nung iba. May inaantay pa kasi kaming isa, pero gusto nung ibang bangkero paalisin na kami. Yung totoo??? Medyo nag-kakaroon na ng kaunting ingitan, dahil ang contact namin ay mayroon ilang grupo na hawak sa araw na iyun. Sana mali ako. Kasi hindi healthy yung ganun sa tourism, locals and to the society. And that's all thank you! The wind is really strong and it's hard to cook, even we're using butane gas. Using wind screen or protector is advisable. There's unlimited water at Laki beach, but not sure if it's potable. But I saw a resident drinking from the faucet, so I think it's safe. Rest rooms are available, but it's blockbuster. TIDY UP at the house of our contact. Bought our lunch at the carinderia by the jump off. Husay! :) Ganda ni Tin! Hahahaha! Hi, may i know who is your contact for the boat? We’re planning to do a day tour. Thanks! hello saan pwde mag contact? Hi.. pwede mahingi number nung contact person nyo? This іs a good tiр especialⅼy tо thօse fresh to tһᥱ blogosphere. Short ƅut very accurate info? Thanks fߋr sharing this one. Hi! Did you stay there for 3D2N? clear your mind prior to writing. I've had a difficult time clearing my thoughts in getting my ideas out there. Hello, constantly i used to check weblog posts here in the early hours in the break of day, because i enjoy to find out more and more. Is there service available from Mariveles to Laki beach for individuals? It is truly a great and useful piece of info. I am glad that you shared this useful info with us. Very helpful info specifically the lasst part :) I care for such injfo a lot. time. Thhank you and best of luck. this topic to be really one thing which I think I would never understand. in your next put up, I will attempt to get the dangle of it! Sino po contact nyo sa boat?